Please Don’t Eat …the Bananas? As we get ready to leave Costa Rica, there is so much to synthesize, savor, remember. And as we try to pull it all together, there are also the Great Imponderables, the messy moral questions. Such as, should one, really, eat the bananas (or the pineapples, or the cocoa, or drink the coffee). The list goes on, I’m sure, depending on one’s eco, to say nothing of human rights, sensibilities. “Hey Mister Talley Man, Talley Me Banana…” the refrain from the decades-old Calypso song ran through my head as we entered Limon Province, true banana country. Bananas were planted here during the building of the cross-country railroad in the 19th Century as fast-growing and cheap food for the workers. When it was discovered that there was an export market for them, the first Banana Republic was born, along with United Fruit Company. It’s story is a complex one, obviously (I actually heard good things about it from old-timers along the coast) but it vanished there at the time of World War II. Bananas, however, remained, and vast plantations of them are now the property of Chiquita and Del Monte. As we passed Chiquita, we saw rows of tiny, but new and very salubrious looking worker houses for single workers. The houses at Del Monte looked as dilapidated as those in the surrounding countryside. 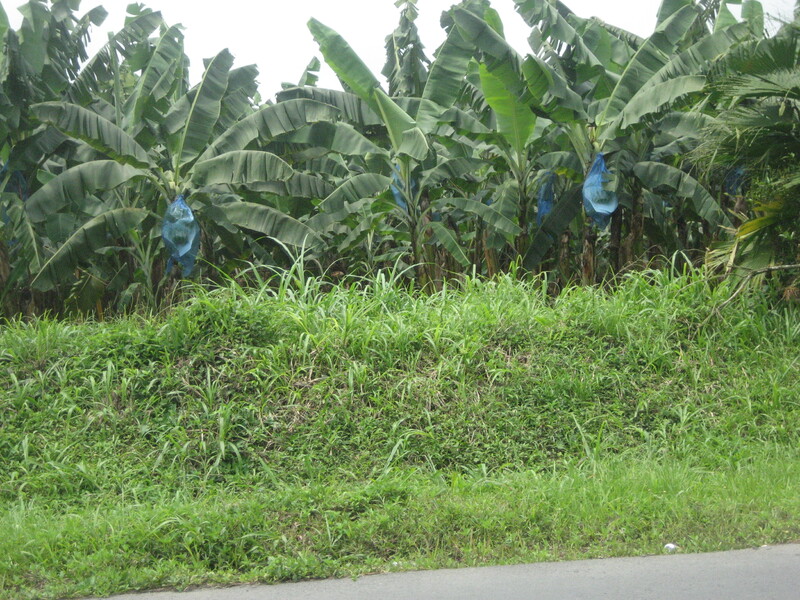 But in one way the companies are eqaul: the bananas on the tree are wrapped in blue plastic bags. The positive version of this technique is that the bags protect the fruit from birds, insects and marauding monkeys (see blog on animal stories). The less benign story is that the plastic bags, themselves a huge environmental problem when they clutter the soil and waterways, are filled with chemicals that do huge harm to the workers, animals, groundwater, etc. that they contaminate. They are also used to hurry up the ripening process for marketing purposes. But because the ability of tropical soil to sustain the plantations is limited, after about 20 years, it is depleted, and the planters move on to new land. Often bananas are planted where cocoa used to grow, and cocoa has its own difficulties as a crop. When the bananas are “finished,” the land is most often sold for pasture land, and the notoriously damaging herds of cattle are moved in, and more rain forest or jungle is destroyed. Sometimes the pastureland can revert to bananas, I was told, but mostly it doesn’t. As for organic bananas, my guide through those plantations said they were tried on an experimental basis, but were too expensive, so now Costa Rica doesn’t grow any. Meanwhile, Costa Rica has moved from the old Banana Republic days to becoming a thriving Banana Democracy, if you forgive the poetic license to describe it’s second most important source of income. Its number-one money-maker is…tourism, itself an environmentally harmful “crop,” and one that ensures a continuing market for coffee and cocoa and, well, bananas. 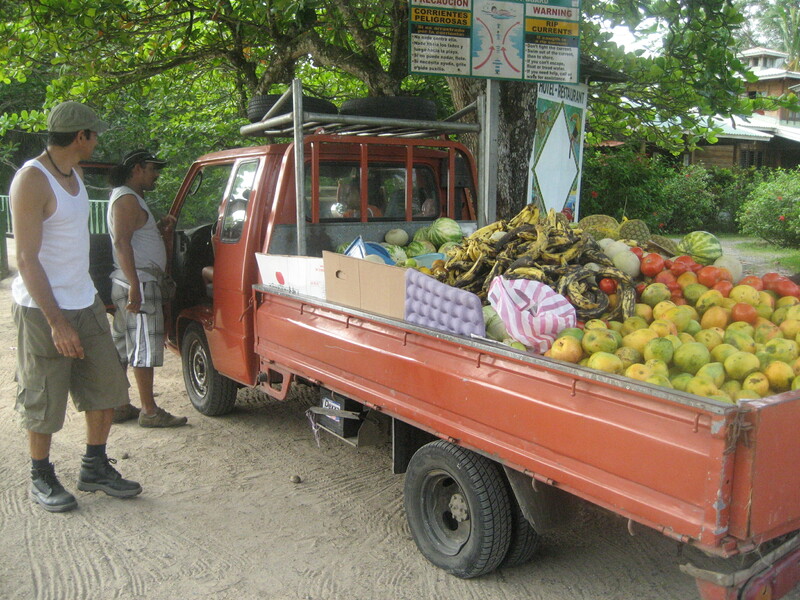 So, should I wish customers would stop buying these delicious fruits, and deprive so many people of their incomes and the country a major source of income? Or should I just take my tourist self out of the picture, go home, and never eat another piece of imported tropical fruit? Clearly I have no answers to such endless, reductive questions. But I do know that surrounded by all those blue plastic bags, I sat down to think about it and tried to decide what to eat. Then I pushed away the platter of beautiful fruit and decided, all things being equal, to order for the first time since I came here that other perennial on Costa Rican menus, el hamburguese.